Carlo Ancelotti has made a record-breaking start to his time as coach of FC Bayern München, with a goal difference of 20:0 after his first five games in charge. Not yet signed up the the Official Fantasy Bundesliga? Click here to do so and show your mates who's boss! It is the best-ever start by a new Bayern coach after five games, and his side's next outing is a Bavarian derby at home to FC Ingolstadt 04 on Saturday (kick off 15:30CEST/13:30GMT). 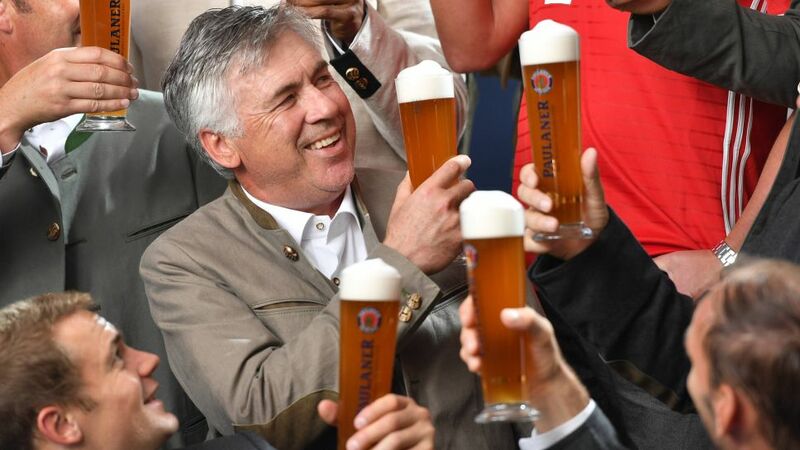 With the match coinciding with the start of Oktoberfest in Munich, Ancelotti and the Bayern squad took part in the traditional pre-festival photoshoot wearing Lederhosen while toasting the event with a glass of world-famous local beer. "It's a new experience and fun. It feels good,” said the Italian. Bayern will be without Philipp Lahm, David Alaba and Thomas Müller on Saturday due to a gastroenteritis bug that has affected the squad. However Ancelotti did confirm that Joshua Kimmich, who scored three times over the course of Bayern’s wins against FC Schalke 04 and FC Rostov in the last week, will start for the first time in this season’s Bundesliga. "I haven't decided on the line-up yet, but Kimmich will play tomorrow," said Ancelotti. "He can play anywhere. Right-back, full-back, left-back, central midfield - and as a forward too, as we've seen."